You’d think, with the introduction of small-frame semi-automatic pistols, that concealed-carry revolvers are as dead as last year’s political promises. However, such is far from the case. While the military and most of the police have gone to the semi-auto, the double-action revolver still finds favor among armed citizens. Good quality concealed-carry revolvers are about as foolproof as any of man’s machines. They very rarely malfunction and will, in fact, still fire after a good deal of neglect. A loaded revolver has no depressed springs, which can weaken over the years and cause problems. 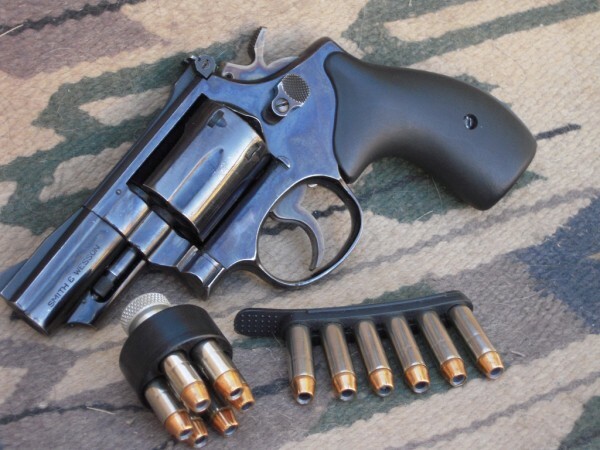 Among small handguns, the pocket revolver is far more reliable than most comparable semi-automatics, which are known to be finicky about ammo choices and will malfunction if a strong grip is not used. The various sizes of revolvers guarantee a fit for just about everyone, regardless of hand size. Small, medium or large—sounds like a shirt ad but, in fact, defensive revolvers are available in all of those configurations. Matching a frame size to the shooting hand and giving due consideration to selecting a set of stocks that compliment individual needs go a long way to personalizing a DA revolver in a way that exceeds that of the auto pistol. Concealed-carry revolvers have it all over semi-autos when it comes to caliber choices. From .22 LR right on up to the .44 Mag. and beyond, there is something for everyone in revolver calibers. In addition, since the revolver is not dependent on a particular power level, a person can load what works best for them in a given caliber. For instance, in a .357 Mag. revolver the shooter can use everything from the .38 Spl. target wadcutter loads right on up to the hottest magnum. You’ll notice that I haven’t mentioned ammunition capacity. An examination of scenarios where a firearm is used for personal defense will show that ammunition capacity is rarely an issue. If the five- or six-round capacity of a revolver cylinder is the only thing stopping you from carrying one, rest easy and carry with confidence. However, concealed-carry revolvers may not be the ideal defensive tool for everyone. There are pros and cons to everything, and defensive shooters must decide what works best and meets their individual needs. This entry was posted in Concealed Carry, Guns, Personal Defense, Revolvers and tagged .357 Mag, .357 magnum, .38 Spl, .44 Mag, .44 magnum. Bookmark the permalink. As your photo graph shows that 2 1/2 Combat Magnum I’ll just say I’m a fool for K frame 19s and 66s in snub configuration. I have a nice stable of them. And I am so much a fool for them I was very disappointed when I found out Steve McQueen, in “Bullitt”, used a sissy Colt Diamondback. Never understood that man…..
And I agree, if you can shoot well, a good revolver is totally fine for CCW. Who makes the grips on the revolver in the picture? I like the smooth texture. I like my short barreled revolvers. They can be found in a size to fit almost any hand, and if, a .357 magnum isn’t enough power, you should leave bears and elephants alone. I too am a sucker for the S&W Model 19 and Model 66 with the 2.5 inch bbl! I have always like the look and feel and the 442 & 642 are a reliable choice for concealed carry as well! I personally carry a 642 on my ankle in an original Lou Alessi Ankle holster for probibally the last 15 years comfortibally and comforting as the daily back and forth to work gig that supports our firearm fantasies Monday thru Friday!